다뉴세문경이란 초기철기시대에 나타난 청동으로 된 거울로 잔무늬거울이라고 한다. 잔무늬거울의 뒷면에는 거울을 멜 때 사용하는 고리인 뉴가 우리나라의 경우 한쪽으로 치우친 곳에 2개가 돌출되었다. 또한 청동기 시대에 주로 보이는 거칠게 무늬를 새긴 거울(거친무늬거울)에 비해, 작은 삼각형을 기본으로 하여 기하학적 무늬를 세밀하게 새긴 것이 특징이다. 이 다뉴세문경은 지름 21.2㎝로 뉴가 2개이며 내구(內區), 중구(中區), 외구(外區)로 3등분 되어있다. 각 구마다 작은 삼각형 무늬를 교차하는 방식으로 세밀하게 장식하였다. 외구에는 동심원 무늬가 2개씩 짝을 지어 균형있게 8개를 배치하였으며, 주석이 많이 들어가 빛이 잘 반사되게 만들었다. 현존하는 잔무늬거울 가운데 크기면에서 가장 크고 문양도 가장 정교한 우리나라 초기철기시대를 대표하는 유물이라 할 수 있다. The object was made in the early Iron Age. There are a couple of knobs supposedly used to link strings with it on its backside. Compared to its predecessor, a coarse patterned mirror, this one features exquisite geometric patterns including small triangular patterns. 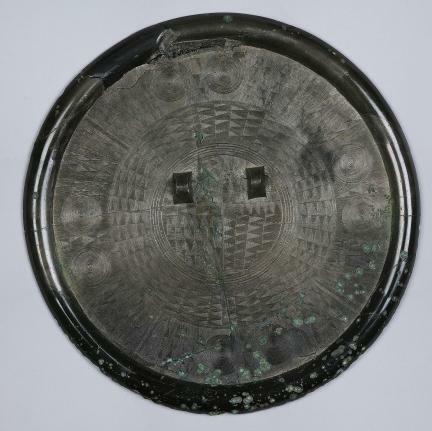 The Bronze Mirror with Geometric Design and Knobs on the Back (diameter of 21.2cm), which is kept at Soongsil University, has two knobs. Its surface is divided into three sections, each of which has exquisitely laid small triangular patterns. The outer section displays four pairs of concentric circles, with each pair consisting of two circles. The mirror, made chiefly of tin, was designed to reflect sunlight well. This one is the largest, displaying the most exquisite patterns among the existing Bronze Mirrors with Fine Linear Design. 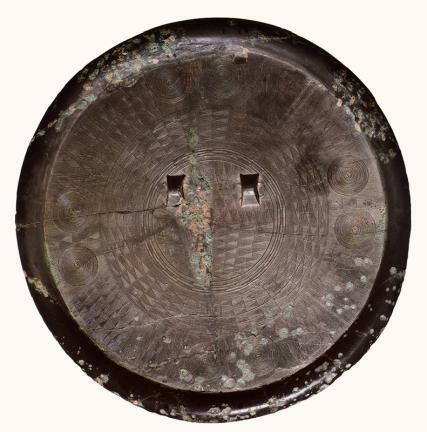 It is a leading relic representing the early Iron Age on the Korean Peninsula.